North Bay Urban Sketchers-yep!...something new and exciting! This 8 hour course will take us to interesting places in and around North Bay where we will draw on location, indoors or out, capturing what we see from direct observation. Media and surfaces will be your choice with suggestions from the instructor when needed. 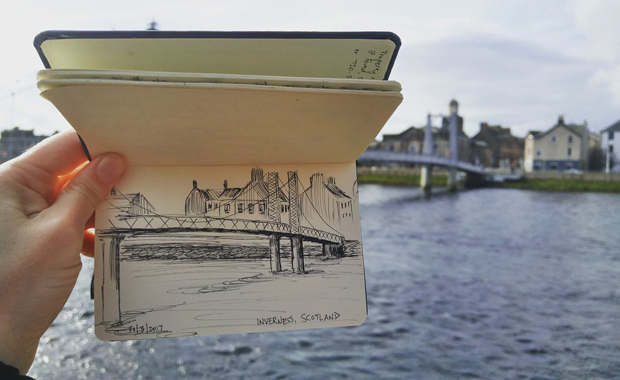 Our drawings will tell the story of our surroundings, places we live or have visited; an accurate record of time and place. Working in a group will facilitate sharing, discussion and support for one another. You can expect to come away with a new ‘eye’ for seeing, an understanding of perspective, and a new appreciation for the uses of many media used individually or in combination. Urban Sketching participants often continue as a group to enjoy sketching with one another long after the course ends.